The Holy Eucharist has been accused of being a cannibalistic rite. René Girard would accept the accusation. In a snippet from an unpublished interview, he suggests that the Eucharist recapitulates the entire history of sacrifice and its violence and that history includes cannibalism. When I took a college course on African and Oceanic religions, one of the essay questions I was confronted with on the final exam was to discuss a few anthropological eyewitness accounts of cannibalistic practice. This was the first time I had encountered anything like it. What struck me about the accounts was how these people were intentionally absorbing, through ingestion, the being of the person, sometimes in mockery but more often in respect. (My take on these documents was affirmed by my professor with a top grade.) This is also Girard’s take. He ties this data into his analysis of the dynamics of mimetic rivalry where a rival moves beyond envying the possessions of another to envying the very being of the other. Interestingly, Jesus himself seems to agree with Girard and the anthropologists on this matter. In John 6, he uses strong language when he tells us that we must eat his body and drink his blood, words that suggest cannibalism and seem to have been interpreted as such by his grossed out hearers who, for the most part, went away so as not to hear anything more about it. Cannibalistic language is often used figuratively in human speech and that is true of Holy Scripture as well. The psalmist affirms God’s deliverance from people who assail and devour his or her flesh (Psalm 27:2). St. Paul warns the Galatians that if they “bite and devour another,” they should take care that they “are not consumed by one another” (Gal. 5: 15). These examples refer to situations of serious mimetic rivalry and even if the psalmist’s enemies and the people of Galatia are “civilized” enough to rescind from literal cannibalism, they are indulging in the essence of that practice. In what I have called the First Supper, Jesus reverses the cannibalism of devouring another person by freely offering himself, body and blood, in the bread and wine so that we may receive the being of Jesus as a free gift rather than as the spoils of a violent victory. 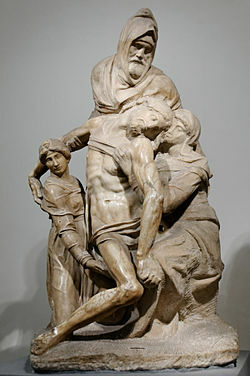 This implies that his death on the cross is a Gift he gives to humanity and is not booty taken away from him against his will as is the booty taken by a conqueror. What kind of personal being are we receiving when we receive the being of Jesus? In the early human centuries, people were absorbing the bravery and fighting skills of a worthy enemy who was defeated. With Jesus, what we get is something very different. This something very different is demonstrated in Jesus’ act of washing the feet of his disciples as a sign that we should serve one another in all ways. 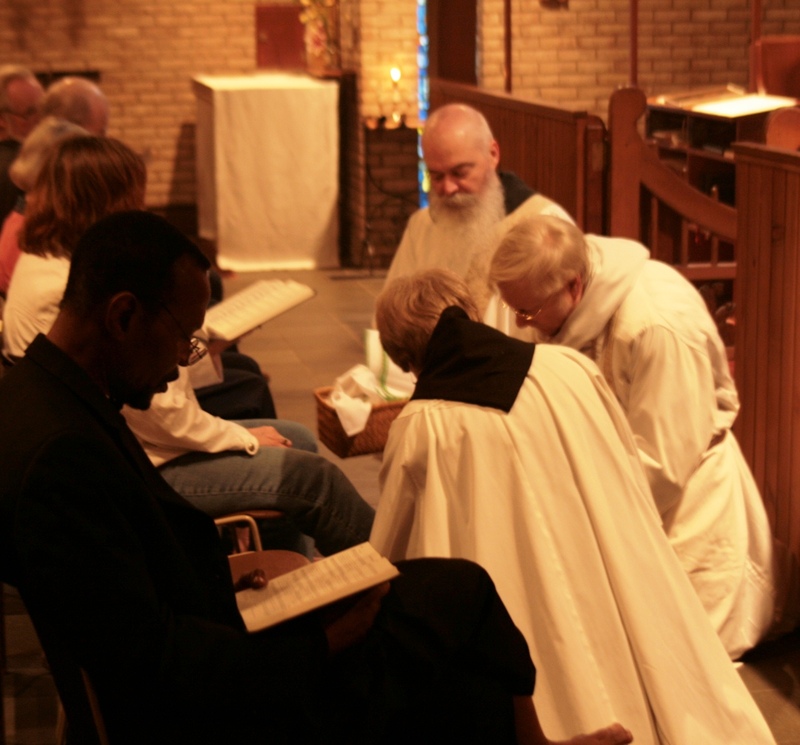 The personal being we receive in the Eucharist is one who, far from wishing to devour another person figuratively, would wish to build up another person in actuality. When we receive the being of Jesus, we receive personal courage beyond imagining, but it is not the courage of one who fights and wins battles against violent foes, but the courage of one brave enough to serve others, even to death on the cross. The story of Jesus knocking over the tables in the temple and driving out the animals shakes us up but then we wonder what we should be all shook up about. 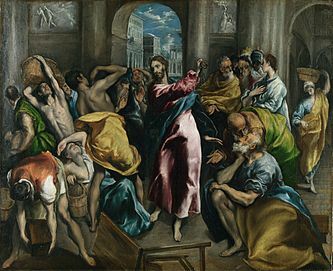 Jesus’ act can be seen as the climax of repeated protests of the Hebrew prophets against the sacrificial cult in the temple. Jeremiah mocked his listeners who jabbered: “This is the temple of the Lord! The temple of the Lord! The temple of the Lord!” (Jer. 7:4). Then there is God’s mocking question from Psalm 50 and repeated elsewhere: “Do you think I eat the meat of bulls and drink the blood of goats?” Amos proclaims God’s hatred of festivals. Most telling are the words of Hosea that Jesus quoted: “I desire steadfast love and not sacrifice, the knowledge of God rather than burnt offerings” (Hosea 6:6.) There is much debate as to whether the prophets wanted the abolition of the sacrificial cult or a reformation that would bring it in line with moral values. In driving out not only the money changers but also the animals about to be sacrificed, I think Jesus is doing a bit of guerrilla theater to prophecy the end of the temple cult, a prophecy fulfilled in 70 A.D. when the combined violence of militant Jew and the imperialistic Romans resulted in its destruction. he prophets consistently denounced the sacrifices made on the “high places,” pagan sacrifices to deities like Moloch who even required the sacrifice of their children. The sacrifice in the temple was more humane in that it was restricted to animals, but the practice derived from the notion that “god” was angry and would be appeased only by sacrifices. The prophets’ denunciations of the temple cult were consistently coupled with denunciations of social violence and injustice where the poor were sold for a pair of sandals as Amos complained. Although it is argued that the prophets thought the temple sacrifices were acceptable, maybe even laudable, if accompanied with righteous actions in the social sphere, but they seem to have a sneaky suspicion that the practice of sacrifice tends to encourage social injustice. The temple setup was, after all, a terrible financial burden on the poor. (I think Jesus was not edified but outraged over the widow who gave the last two coins she had to live on.) The logic of sacrifice was that some living being was always dispensable precisely as the victims of collective violence at the times of social crises were dispensable and their deaths “necessary.” Caiaphas stated the sacrificial logic baldly when he said that it was better “to have one man die for the people than to have the whole nation destroyed” (John 11:50) In modern times this sacrificial logic is expressed by the regretful term “collateral damage.” These considerations suggest that the prophets were convinced that something was fundamentally wrong with sacrificial rites. Jesus, on the other hand, has a totally different, opposite logic; a logic that Paul says is foolishness to the rest of the world. In John 6, Jesus says that everybody the Father gives him will come to him and nobody who comes to him will be driven away. The parable of the lost sheep makes the same point that it is not the will of our Father in Heaven that even one of his “little ones” should be lost. Jesus believed this so strongly that he would accept death on the cross to make the point and, more important, return as the forgiving victim to gather all who will come to him so that none of us should be lost. The pagan deities wanted sacrifices made to them. The prophets kept trying to get it across to everybody that God pours out sacrificial love to all of us through creation and redemption and that God wants the mercy God gives us in return, not sacrifices . Caiaphas was willing to sacrifice Jesus and anyone else who put a spoke in the wheel of the sacrificial logic. Jesus was willing to sacrifice himself rather than sacrifice any of us. That is why we do not slaughter bulls on this altar but pass around the bread and wine through which Jesus gives His very self to each one of us.